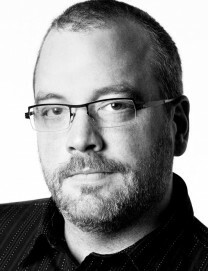 Ben Crain, Improve Digital, CSO, says publishers looking to increase their RTB revenues using a First Look media trading model can seriously impact upon their bottom line. There are a number of very important considerations when undertaking any kind of exclusive or preferred ‘First Look’ relationship with a buying partner. While buyers that request First Look offer aggressive pricing, they have their reasons. Most importantly, in many cases, the pricing only seems aggressive. In reality giving a buyer First Look will usually have a negative impact on revenue. The buyer gets preferred access to premium advertising and audience assets, and via that preferred access, they can assume an advantageous market position relative to the competition. Further, they can ‘de-risk’ their existing business through greater inventory control, and, potentially, they may even open up new revenue streams based on the publishers inventory or data. 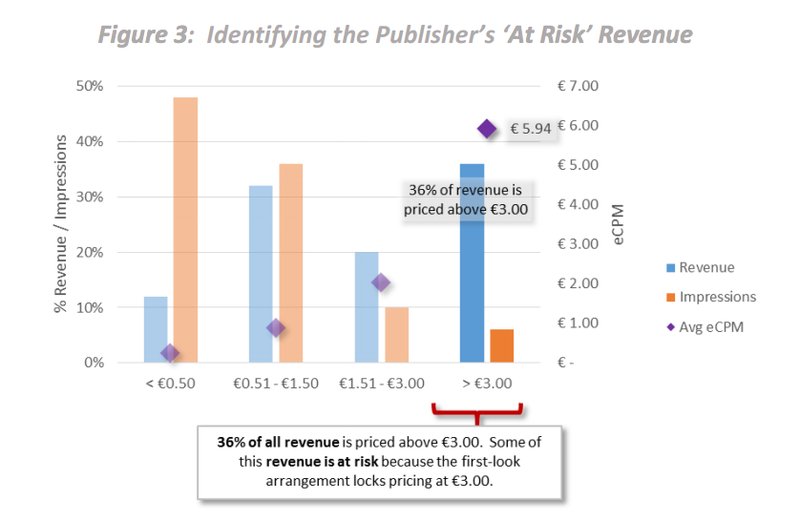 Although beneficial to the buyer, each of these scenarios introduces corresponding business risks to the publisher with whom they strike an exclusive First Look deal. Further, there can be unintended consequences when a publisher extends privileged position to a single party, placing them above countless other partners, many of whom themselves may be very important to the publisher’s advertising business. First and foremost, there is real opportunity cost when locking in ‘First Look’ position with a single provider. Even with a fixed CPM that is higher than the average, it is practically guaranteed that for many impressions, the fixed price will be below what someone else is willing to pay for the same impression. For the purposes of some basic analysis, let’s assume a publisher is considering an exclusive First Look relationship with a partner. 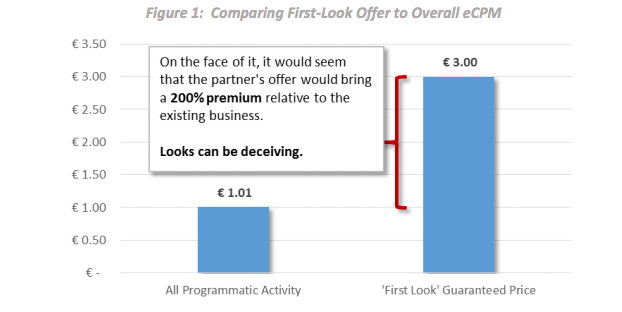 In exchange for that First Look position, the partner is willing to guarantee a €3 CPM for every impression they buy. At the highest level, that doesn’t look like such a bad deal; see Figure 1 (below). In a world where nearly every impression is priced discreetly via an auction process, often based on cookie-level audience attributes, you can never assume that there is a cap on what some marketer might pay for a particular user+impression combination. The €3 CPM one agrees to today certainly introduces opportunity cost, as higher value transactions are sure to be missed. Further, the new €3 from the partner will certainly change their spending patterns. As Figure 2 illustrates (below), with a fixed price of €3, the partner will likely cut back spending on lower value impressions and realize cost savings for high-value impressions. In either case, this is bad for the publisher, losing spend at the low end and selling inventory for less than it is worth at the high end. As Figure 3 illustrates (below), it’s more than the partner spend one must be concerned with. When giving one partner preferred access and a fixed price, others are at a disadvantage, and revenue is put at risk. In this case, 36% of their business currently comes in at a price above €3 and faces this risk. Beyond the direct revenue risk, one must also consider the potential negative reaction from other advertising partners. A typical publisher has hundreds – if not thousands – of customers and potential bidders. Many of these bidders are ready and willing to pay high prices for the right impression and the right user at the right time. 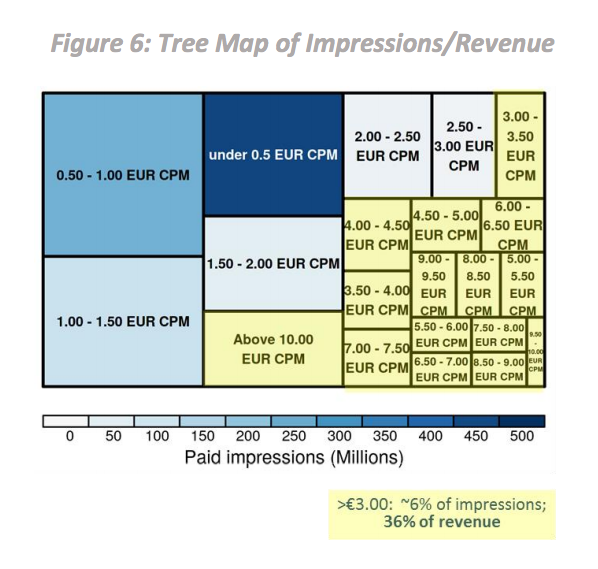 As Figure 3 (above) and 4 (below) both illustrate, although reflecting only 5% of total impressions sold, more than one-third of the programmatic revenue overall was associated with bids above the €3 ‘First Look’ fixed fee. How many of the publisher’s high-value clients will tolerate having their bids trumped time and again? How will their future spend levels be affected if they are unable to secure the impressions they need from that particular publisher? 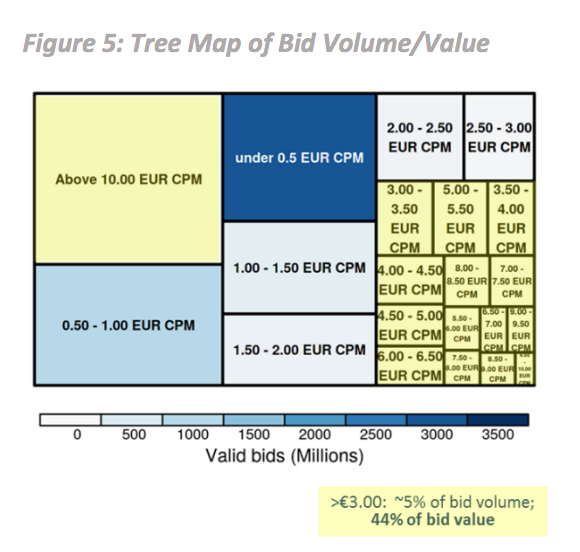 To further illustrate this point, Figures 5 and 6 (below) are ‘tree maps’ exposing bidding volume and relative value across different price segments. Figure 5 shows bid volume and potential value, reflecting all bids received for inventory and the prices bid for those placements. Figure 6 shows all impressions sold and the revenue realized based on the winning bids in the auction. Not surprisingly, the relative distribution of impressions and bid volumes are comparable. There is a vibrant market for the publisher’s most valuable inventory. That demand could be blocked if one partner received unfettered access at €3 CPM. Second, one should consider the impact a First Look arrangement has on bidding dynamics. Locking in these impressions at a fixed price de-risks the buyers’ business model. They are guaranteed exactly the inventory they want; they can plan their media costs very easily; and they eliminate the operational burden of managing a complex trading operation to fulfil their own ‘demand’ commitments. While it makes the partner’s life easier, it can have a hidden impact on the publisher’s programmatic business. The clearest example of that impact if the potential degradation of bid pricing in RTB. 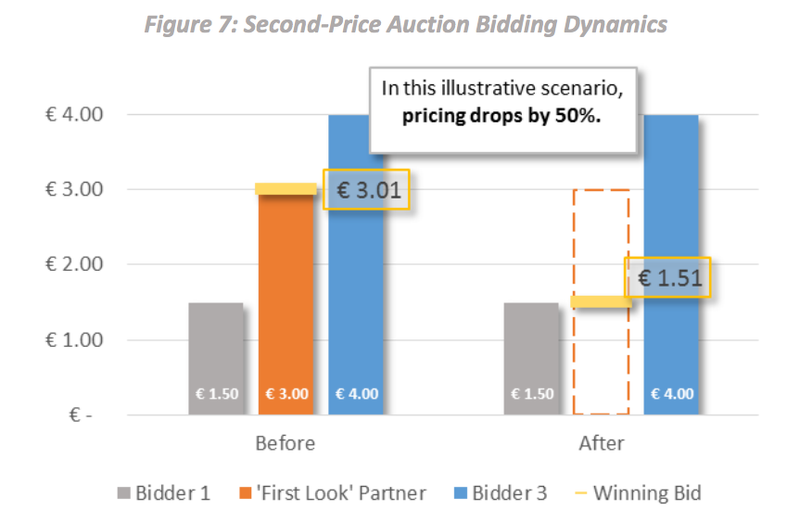 As Figure 7 (below), illustrates, even removing a single ‘high-value’ bidder from a second-price auction can lead to realised prices dropping dramatically for some placements. Figure 7 provides a snapshot of a single impression and three bidders, one of whom has been given First Look. With its before-and-after views, the chart demonstrates how the removal of a single bidder could drop the realized price by 50%. Although the scenario portrayed may be simplified for illustrative purposes, the negative risk to inventory yield is no less real. Finally, what buyers looking for First Look are ultimately paying for is access. They want First Look at every impression. They don’t intend to take all of them. They will pass on many impressions and let them drop into the auction. For other impressions, they may act on them, but there is no guarantee they will have an actual match in the pool of campaigns they are serving. What happens then? Perhaps they resell that impression themselves, at a profit, via another programmatic advertising exchange. This First Look access is also giving them privileged access to all of a publisher’s users. With every ad call, they can see a user and perhaps collect some important information about their surfing behaviour and content affinity. How is that data then used? Certainly to fuel the optimisation engine – and perhaps to inform user profiles sold via a data exchange. Further, Improve Digital has seen many instances where the code being used to generate First Look via the ad server is collecting much more than just information about the user, often scraping important page- and site-specific details as well. Figure 8 (below) explores some of the dynamics at play. While Improve Digital can’t know what is in the T&Cs of specific publisher agreements across all of buyer relationships, we have certainly seen behaviour like this before. 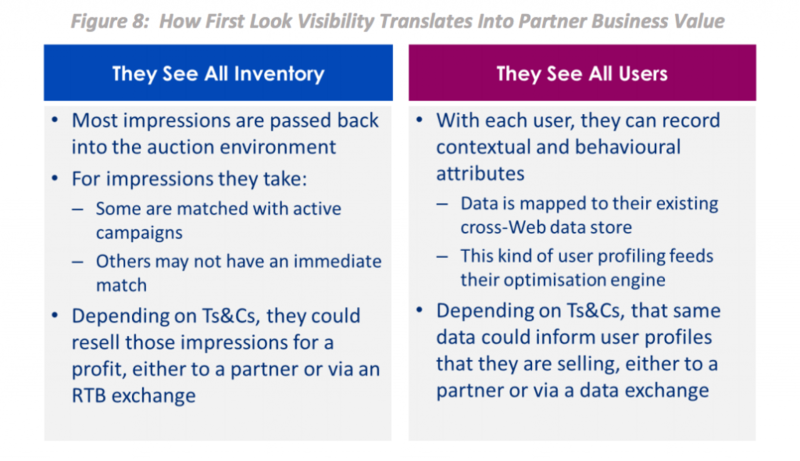 When inventory and data leakage does occur, not only is a publisher missing out on a monetisation opportunity, but they are also at risk of undermining brand image, product value, and user privacy commitments. What is perhaps most irksome to Improve Digital in these fixed-price, First Look scenarios is that, if a third-party is so convinced that the inventory in question is worth €3, so much so that they will lock that price in up front, why not simply bid accordingly in the auction and take their chances? 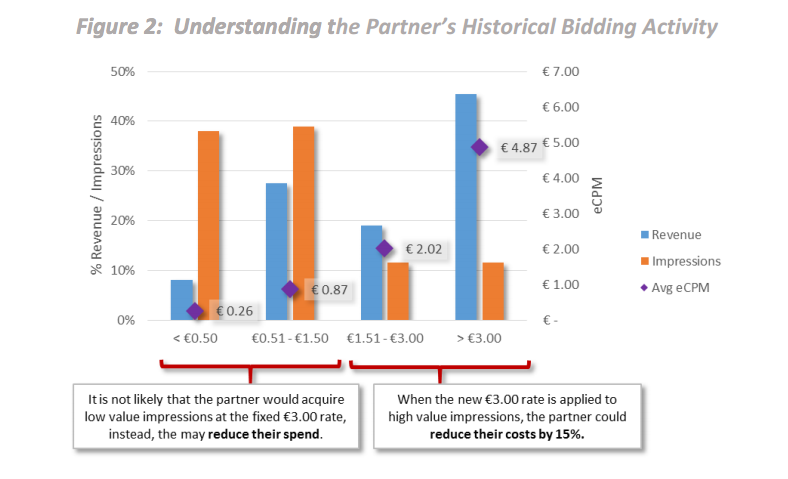 If the partner is right, and the €3 CPM they offer is as good as it gets, they should accept a level playing field. According to their logic, they can simply bid that €3 all the time and always win the impressions they are after. If a publisher is looking to grow their programmatic revenue, a First Look scenario should be the last option they consider. In the RTB environment, anyone who argues that eliminating price competition is somehow good for business is clearly working another agenda. Namely, they are trying to eliminate their own business risks, streamline their operations, and spread their marketing spend around more efficiently. In an auction everybody essentially has First Look – that’s why auctions work as well as they do. The person with the highest willingness-to-pay always wins. Accordingly, it is the publisher that eliminates the risk, not the other way around. It’s Improve Digital’s firm belief that giving one party in an auction an unfair advantage over other bidders is dangerous to publishers and media owners. More often than not, it benefits only that one party, puts all other buyers at a disadvantage, a fact they are often ignorant of. Most importantly unnecessary risks are introduced to the seller’s business. There are, however, justifiable cases where inventory and price guarantees are appropriate and acceptable. 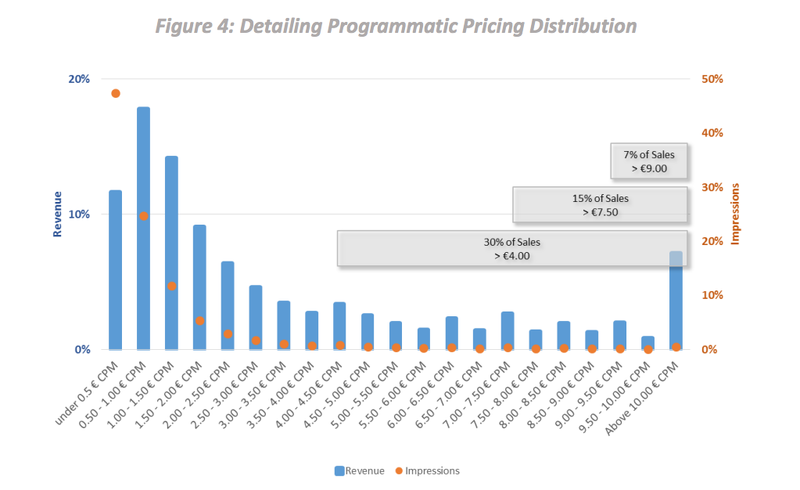 After all, most publishers’ sales operations are built on a foundation of high-value direct sales. Increasingly, buyers and sellers both are leveraging the programmatic techniques pioneered in RTB to manage some portion of direct sales, capitalising on the considerable process efficiency gains those techniques can deliver. Given the shift, multiple tiers of campaigns have emerged within automated sales channels, with great variance in priority, inventory guarantees, and pricing models. In response to this, some programmatic service and technology providers are strengthening their channel management capabilities. Improve Digital for example, has invested heavily in a ‘full stack’ yield optimisation solution, enabling dynamic scheduling, intelligent serving, holistic bid and price floor management, and smart campaign prioritisation. In cases where a partner deserves special treatment, we recommend you accommodate them in a way that is efficient, predictable, and safe for the bottom line. Rather than First Look, consider clearly defined ad placements, user targets, and impression guarantees. Rather than blanket €3 pricing trumping all RTB bids, negotiate pricing at the product and user level, sensitive to the willingness to pay of other parties so you can guard against revenue loss and opportunity cost. Ultimately, we find that transparency and clear expectations are all that are required to ensure all parties in a media transaction can get more of what they want, no matter what the circumstances.